A few days ago I wrote a post about a flier which was handed out as part of the efforts to quell the tensions during the “Style Wars” in the late 90’s/early 2000’s. However without context it is a far reach to not see the people getting involved in this debate without seeming a bit loony. So to help put you in the shoes of a late 90’s LA swing dancer I have this article written by John Cooper for Swivel Magazine . Mora’s Modern Rhythmists, the Monday night house band at The Derby was having their new CD release party that evening. Since I wrote the liner notes to Dean Mora’s new CD, I wanted to be there for the big occasion.Yes, I’d meant to go numerous times in the past, but stuff happens. I mean we all know stuff happens. So… I announce to my friends that I’m going, really going this time, and I go. Monday is always a zonky day for me and I almost skipped it, but when I got home, I had an e-mail from Peter Loggins that said simply, “Monday.Mora.Derby.Be There.” So I go. I motor over. I know where it is. No mystery. I cruise on down Los Feliz Blvd. I make a left on Hillhurst. WOW! Better than a pretty woman: two beautiful parking spaces right on the street! And I maneuver my land yacht right into the loading zone. I knew it was too good to be true because I’ve lived in Los Angeles to long to believe in the power of positive parking. I cruise out of the Fool’s Paradise and just guide my machine into the parking lot. I eyeball the place from the outside. I walk around the building looking for the entrance. Not that door, that’s a restaurant. Not that door, that’s an exit. How do I gain entrance? I do 360 degrees around the building. Look! Up that flight of stairs! People! I walk up the steps that have measured a million swing feet. I announce myself. I am in! Now… I had no notion of how the place would look. I just knew that the dance floor in the main room was considered small and the back room was off to the left as I would enter. I went to the right to the main room. Oooohhh! Pretty nice! A big circular bar dominating the room. A vaulted ceiling. The band stand at the opposite end of the room. Nice. I head out to take a look at the back room where the Lindy lesson is already in progress. Erik and Sylvia are at it again. The room is packed with ‘progressing’ Lindy Hoppers. Even as I lean against the wall, I am in the way of several rock steps and the humidity is killer in there, like a night in the tropics. I exit back to the main room and stake out a choice seat at the bar. I order a delicious Mai Tai. I see Dean Mora setting up his men. I saunter over and say “Hi.” Friends and people I know are beginning to arrive. They either see me or I see them.Handshakes, hugs and dropped jaws are the order of the evening. “You’ve never BEEN here before?” No. “I’ve never SEEN you here before!” First time. And on and on. Soooo many people I know are there tonight for Dean’s CD party. We meet and greet. Peter and Lisa. Debbie and Darren. Rusty Frank. Chuck Cecil. Lisa Johnson. Tip and Holly. Hilary Alexander. Jeff Beauregard. Nicole and Bill. Hey! There’s Chekov from “Star Trek” out there! There’s famed movie swing dancer John Mills milling around! Then… an announcement by Dean Mora, and his Modern Rhythmists tear into a track from their new CD and the party is underway! The dance floor holds a dozen or so couples comfortably. Most every one is doing Hollywood style Lindy and/or Shag. Dean’s snappy band and attire make the room glow almost as much as the perspiration on the foreheads of the pounding feeted patrons.Very few posers here on Mondays, it seems. Just people into the dancing and into the music. Real music! ‘Quality Shout.’ Oh, yeah! After an hour, the second set begins with more (A) great music and dancing. More people I know have arrived. There’s an Australian TV crew wandering about and shooting Erik and Sylvia on the dance floor, while Dean Mora jovially suggests to the camera crew that they would do well to get him in the shot, too. Another hour passes into Derby memory. Peter Loggins and I exchange money for Jan Savitt and Charlie Barnet records. I eye a stack of “Swivel” magazines to take back to my store. Mora’s Modern Rhythmists are cracking like a whip. The Swing and the good feelings engulf the room.There’s Rory. There’s Adrian. There’s Minh. There’s Shawn and Cassandra. There’s Morris. All real people doing real dancing, not posing, to real music. You saw “Swingers?” Forget it! It’s a hoax! It’s not ‘money’ (What a fake-a-roo phrase that was.) This is the real Derby, at least on Monday nights. Men and women who take the time, trouble and expense to dress ‘vintage’ and to learn an established form of dance properly and devote themselves to it, not obsessively or stupidly, but out of love and a sense of sheer joy. I stayed until the end, but even the ‘end’ was not the ‘end,’ for the dancing continued even after the Dean and his men had packed up and left. Moves were practiced, stories told, dances danced. Plans and partings until tomorrow or the next time. Hugs, kisses, hand shakes and promises of more visits. “See? I TOLD you you’d like it!” The dude was right, I did. 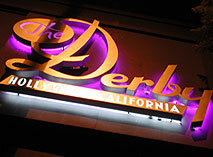 Unfortunately I never had the privilege of dancing of dancing at the Derby in Los Angeles. However you ask any dancer of 5+ years in California about the Derby (or Old Memories/Monsters of Swing) they will have a gleam in their eye as they spin a few yarns. An amusing tripod site, http://socalswing.tripod.com/ was the precursor to the forum JiveJunction which for awhile existed as Yehoodi’s rival forum until mysteriously disappearing becoming Ruben Browns personal homepage. 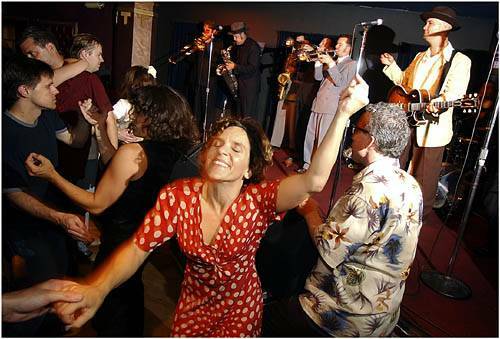 The site has some interesting sub-pages that offer insight into the culture of the late 90’s/early 2000’s Southern California swing dance scene. One that caught my attention was a page (http://socalswing.tripod.com/youmightbe.html) listing offshoots of a popular joke “You might by a (insert noun) here if….” modified for the So Cal swing dance scene. My personal favorite was, “You might be a Hollywood style Lindy Hopper if….”. the faster the song, the better. you can’t hear the “clang clang clang” section of a certain Andrews Sisters song without picturing Jewel McGowan swiveling. you become convinced that someone requesting “Zoot Suit Riot” at a Bill Elliot show is one of the seven signs of the coming apocalypse. you have come to realize you will never win a contest again as long as Josh & Theresa, Minn and Corina, and Jeremy and Debbie are in it. Matthew 7:15, Beware of false prophets, who come to you in vintage clothing but inwardly are flaming West Coasters. Even though I have given you a small taste of what it was like back then my advice if you want the whole picture is talk to someone who danced there. I promise you most of them will be more then happy to talk your ear off with stories about Monsters of Swing, The Catalina Jazz Dance Festival, Old Memories, and et cetera. I’ve just given you a small glimpse into a much larger picture. This entry was posted on April 24, 2011 by Apache. It was filed under Dance, Lindy Hop .